We’re excited to share a brand NEW addition to the list of RWYK certified Great Reads! 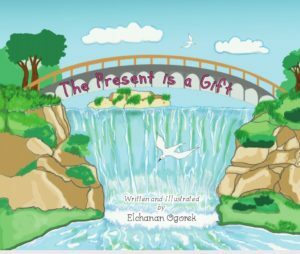 Mega excited to announce that The Present Is a Gift by written & Illustrated by Elchanan Ogorek has been named a Reading with Your Kids Certified Great Read. Elchanan’s book teaches children focus and mindfulness through the observation of mindful animals practicing yoga. At ReadingwithYourKids, we LOVE reading children’s book and recommending the best books for your kids that will get them reading like crazy. That’s the biggest reason why we started Placing a Reading With Your Kids Certified Great Read seal on books or products we think will tell the parents, grandparents, educators, and caregivers that they are giving their kids the very best. So we hope you and your family enjoy reading The Present Is a Gift as much as we did! Congratulations to Elchanan Ogorek for winning RWYK Certified Great Read Status for The Present Is a Gift! Read on to learn more about Elchanan and his book! The Present is a Gift is a children’s picture book that takes us on a journey to achieve mindfulness. Readers are transported from a classroom out into nature to observe animals in yoga poses and practicing mindfulness. Children will enjoy the illustrations and learn to live in the moment, reduce stress and build confidence. 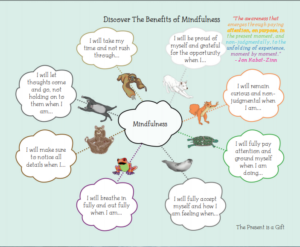 Included in the book is a kid-friendly mindfulness guide that learners of all ages will love. The Present Is a Gift is available for purchase on Amazon! Elchanan is an author and social worker with a passion for teaching people, especially children the importance of; embracing the positive side of life, living in the moment and, having a happy, positive attitude. Elchanan discovered the rewards of yoga and mindfulness some years ago. Over the years, he has fully embraced yoga as a positive exercise. He has embraced mindfulness to achieve balanced living and a deeper appreciation for things. His discovery has helped him in raising his children to be attentive, appreciative and mindful of people, animals and things around them. This discovery also inspired in him, a desire to help people live with meaning from day to day. Elchanan is a devoted father to his two sons, Leo and Oliver and loves to spend his downtime with his boys. Finally, Where Can We Find Elchanan Ogorek Online? Add some mindfulness to story time with this fun and educational book, written to help kids appreciate their world from the inside out! What a fun, interactive yoga book for children! The Present Is a Gift, a children’s picture book written and illustrated by Elchanan Ogorek, teaches children focus and mindfulness through the observation of mindful animals practicing yoga. This book is a wonderful resource for parents and caregivers on how to raise children with an understanding of the importance of love, kindness, gratefulness, and respect and learn some informative facts about the featured animals. The book follows a simple story where the readers are taken on a mindful journey out of the classroom to observe some mindful animals practicing yoga poses and then they are taken back to the classroom to learn some lessons from the amazing animals. Young readers will also learn some amusing facts about these animals and the importance of being grateful and living in the moment. We love how Elchanan has selected all the basic poses of yoga and presented them in a simple and playful style. What a brilliant way to help children to focus their attention, as well as to observe their thoughts and feelings without judgment! In this gorgeous picture book, readers learn what it means to be mindful and present in the moment through the animals practicing yoga poses with fun facts that are inspiring and also entertaining. Teachers can introduce these fun and easy yoga poses in a classroom environment. We’re sure it will be a fantastic way to get kids moving, promote body awareness and develop their listening, communication skills. The author has presented all the information in an easy-to-read and easy-to-follow format. Some of the animals featured in the book include the sloth, wolf, turtle, bear, squirrel, and cat. Each animal in the book represents some fun and informative facts about them along with a mindful lesson for kids. The Sloth who is shown doing a child’s pose teaches kids to take time to learn things and not rush through the moment. Other interesting animals are Turtles – who can hide their heads inside their shells and it teaches kids to fully focus on the moment. The fun fact about Cats are they often sleep 16 to 18 hours a day and their reference teaches kids to let the thoughts and emotions come and go. The fun fact about Seal – they have blubber, a layer of fat, that keeps them warm in frigid waters and the mindful idea is to fully accept yourself. The end pages of the book also contain yoga poses of each animal, helping to retain the attention of readers. Overall, The Present is a Gift has some amazing lessons that will help your child feel calmer and more content. They will learn about self-acceptance, self-confidence, being kind, finding the silver lining and overcoming fears. We love this book and think it’s a wonderful read for adults, too, because it reminds us to take a moment and acknowledge that The Present Is A Gift. A valuable book to have in any home or school and definitely one worth reading. Make sure The Present Is a Gift is on your child’s bookshelf! Click the play button to check out Elchanan’s appearance on the podcast!